Abstract. Although precipitation has been measured for many centuries, precipitation measurements are still beset with significant inaccuracies. Solid precipitation is particularly difficult to measure accurately, and wintertime precipitation measurement biases between different observing networks or different regions can exceed 100%. Using precipitation gauge results from the World Meteorological Organization Solid Precipitation Intercomparison Experiment (WMO-SPICE), errors in precipitation measurement caused by gauge uncertainty, spatial variability in precipitation, hydrometeor type, crystal habit, and wind were quantified. The methods used to calculate gauge catch efficiency and correct known biases are described. Adjustments, in the form of transfer functions that describe catch efficiency as a function of air temperature and wind speed, were derived using measurements from eight separate WMO-SPICE sites for both unshielded and single-Alter-shielded precipitation-weighing gauges. For the unshielded gauges, the average undercatch for all eight sites was 0.50mmh−1 (34%), and for the single-Alter-shielded gauges it was 0.35mmh−1 (24%). After adjustment, the mean bias for both the unshielded and single-Alter measurements was within 0.03mmh−1 (2%) of zero. The use of multiple sites to derive such adjustments makes these results unique and more broadly applicable to other sites with various climatic conditions. In addition, errors associated with the use of a single transfer function to correct gauge undercatch at multiple sites were estimated. How to cite: Kochendorfer, J., Nitu, R., Wolff, M., Mekis, E., Rasmussen, R., Baker, B., Earle, M. E., Reverdin, A., Wong, K., Smith, C. D., Yang, D., Roulet, Y.-A., Buisan, S., Laine, T., Lee, G., Aceituno, J. L. C., Alastrué, J., Isaksen, K., Meyers, T., Brækkan, R., Landolt, S., Jachcik, A., and Poikonen, A.: Analysis of single-Alter-shielded and unshielded measurements of mixed and solid precipitation from WMO-SPICE, Hydrol. Earth Syst. Sci., 21, 3525-3542, https://doi.org/10.5194/hess-21-3525-2017, 2017. 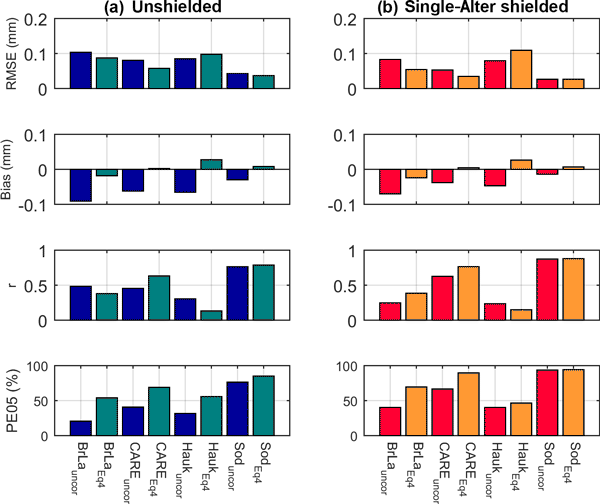 Precipitation measurements were combined from eight separate precipitation testbeds to create multi-site transfer functions for the correction of unshielded and single-Alter-shielded precipitation gauge measurements. Site-specific errors and more universally applicable corrections were created from these WMO-SPICE measurements. The importance and magnitude of such wind speed corrections were demonstrated.